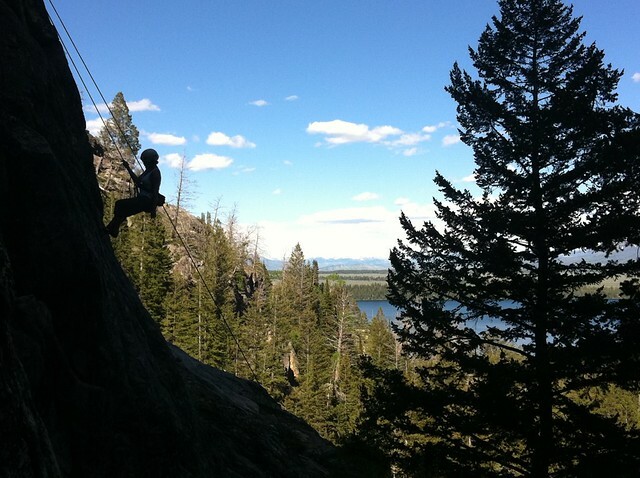 PART 9 (DAY 11): “So you just want to climb?” asked Jim, the veteran rock climbing guide that Cheryl and I had hired to take us up a natural wall in the Teton mountain range. LET’S REWIND: WE HAD DRIVEN NOT WEST from Wyoming towards our final destination of California, but southbound for a long scenic detour down the Mountain Time Zone to check out some more of America’s legendary national parks — the first one just next door. While Grand Teton National Park is directly south of Yellowstone (they share a border post), its landscape is distinctly different; gone were the smelly hot springs and geysers of YNP’s subterranean volcano, but magnificent snowy mountain peaks instead — an entire range of them — standing proudly on American soil. I had wanted to see them after non-Die Hard John McClain (Patagonia) had raved about them; he had told me that before Torres del Paine, they were his default answer to “the most beautiful mountains he’s ever seen.” Upon driving into the park and stopping at turnouts to take photos, I definitely could see his close-call comparison. A bigger car pulled up just after us, and she turned them away. Cheryl and I set up camp, hid our food from bears, and then head down to the Exum Mountain Guides office to meet up with our guide, Jim. “So how long have you been climbing?” I asked him as we trekked from the office to the boat that would take us across Jenny Lake to the base of the Tetons. “I’ve been climbing since… dinosaurs roamed the earth,” he joked humbly. He was an older greying man, but not super old — perhaps fifty-something — with decades of rock climbing experience in him that you could just tell from his weathered demeanor. Originally from Rockville, MD, he started climbing as a teenager, ditched Maryland and head west to climb. Since then he’d been climbing all over the world, but had settled in the Tetons for the time being to make some money as a guide; mountaineers from around the world come to the Teton range to ascend the Grand Teton, a.k.a. “America’s Matterhorn.” We wouldn’t be that ambitious and just do some climbing routes in Cascade Canyon, “the training ground for people going up the Grand,” he said. “I had my shot at Ama Dablam,” he told me, reminiscing about his attempt at “Nepal’s Matterhorn” in the Himalayas. “Until I realized that altitude doesn’t really sit well with me.” I told him about my failed bout with altitude in the same region, and we started bonding over world travel. A BOAT NAMED “JENNY” (the most beautiful name for a boat in the wide world, according to Forrest Gump) took us to a trailhead where we walked for about twenty minutes to Hidden Falls. From there, we jumped the fence, hiked up another trail, and entered Jim’s hidden climbing zone, where we set up camp next to another couple of climbers, and hid our food from a pesky marmot who had come to associate the area for good snacks left alone by the absent-minded. Going down the rock face was fairly easily; Jim eased us down from the top rope (TR) climb, and there were ways to walk down the wall after multi-pitches via steep but doable paths along the sides. Jim daisy-chained us to him to “short-rope” us down just in case. “We used to just walk down here [without short-roping],” he told us. “Did anyone slip?” I asked. “No, but the insurance companies make us do it,” he answered before going on a small tirade of non-climbers. “[It’s been mandated] by a bunch of people who work down stairs, who never go outside, and are afraid of everything.” I liked the guy’s attitude, and saw similarities in my own. Jim might have been a kindred spirit outside of the office but as for indoors: “I was thinking of riding the dot com thing back then too. I was going to go back to school and get my associates in IT, [but then I realized that I’d just deal with stupid people who call up asking why their computer isn’t working when I would ask, ‘Is it plugged in?’] So then I just decided to be a climbing bum.” He’d decided that early on in life and hasn’t turned back, seeing a lot of the world in the process. “The problem is once you start traveling, it’s hard to stop,” I told him. I think that earlier that day Jim might have been wary of who he’d be guiding that day — whether or not we’d be annoying noobs with nothing in common with him — but it seemed he was content with my bond of world travel, and Cheryl’s experience and willingness to learn new things from a seasoned mentor. They spewed a bunch of climbing jargon back and forth that was completely lost on me. “[See this gear? ]” he showed her. “This is still left from the eighties. I still use them. I told you I was a dinosaur.” He seemed happy to school us on different ties we didn’t know about, like the Yosemite Finish, an alternative way to tie the standard figure-8 tie that you do in an indoor rock gym that doesn’t require as much rope. “Promise me you’ll continue climbing and that you’ll remember this,” he asked of Cheryl when showing her a new technique. “Yeah, I don’t mind coming to work most days,” Jim answered. PRACTICE MAKES PERFECT, not only in rock climbing, but in the art of camping — this time back on the other side of Jenny Lake without the car nearby. Cheryl and I already knew the drill of setting up our temporary home in the outdoors, from pitching the tent, to inflating the cheap air mattresses we bought at Wall Drug in South Dakota, to making dinner (a makeshift spaghetti alfredo with broccoli this time). I had started to master the art of improvisation, using olive oil instead of butter, Coffeemate instead of milk, and the hood of my rain jacket as a cooler to chill our beers. Making a campfire for warmth came easier to me each time I made one; it used to take me hours back in the day, but I got finally got my technique down pat. And, sitting there that night in Grand Teton National Park, I finally perfected my marshmallow toasting skills, making them completely melted and gooey on the inside without burning them black on the outside. With my snow hat and unshaven face (I hadn’t shaved since we left the east coast), I was looking like quite the experienced mountain sherpa, but perhaps the only thing I was not getting the hang of — other than playing Scrabble (Cheryl beat me) — was storing my glasses properly (which I don’t normally do at home since I usually wear them). They split in half when I left them in my vest pocket unprotected. WE ONLY SPENT A DAY AMIDST THE TETONS, but at least we camped in arguably the most beautiful place to stay, and experienced the mountains up close and personally guided by a skilled climbing dinosaur. The next morning, Cheryl and I headed southbound and exited the national park, as a Pepsi truck rolled in — providing “the most defining picture of America” I’d taken thus far. After four days and four nights in two of America’s great national parks, we’d recharge in a city — one with close proximity to a salt lake — for a brief hiatus before heading to the great outdoors again. Finally caught up on your entries on the Nadgir roadtrip to Maine. Happy 4th! Erik-hope you stick around Cali around July 20-i’ll be in San Fran on business. My cousin is working at Exum now… she probably knows him!